The St. George Lycabettus hotel is a city hotel conveniently located in the upscale neighbourhood of Kolonaki – Athens' most exclusive quarter. This Boutique Style Hotel is situated on Lycabettus hill and offers breathtaking views of the Acropolis. 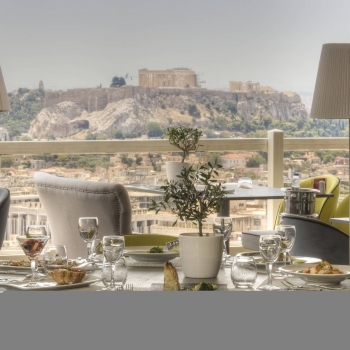 This hip Athens city hotel perfectly combines fashionable design elements with comfort and elegance. The St. George Lycabettus hotel is equipped with all modern facilities and is perfectly designed for the most discerning traveler. With various types of rooms and suites, the St. George Lycabettus boutique hotel is an excellent choice for all travelers looking for modern and fresh hospitality. Sensia Spa and Gym, swimming pool, Le Grand Balcon restaurant, SGArt Gallery. Complimentary Wi-Fi internet access only in all public areas. TV, individual climate control, safety deposit box, hair dryer, fully stocked mini bar, internet access, tea and coffee making facilities. Guests relations services, luxury shopping information, car or limousine transfer services, tour and excursion services, special event services, travel desk services. Average Rating: 8.3/10 What's This? Customer Responses: 124 What's This?